I am away at my mother-in-law’s in the English Midlands this weekend so I’m writing this a couple of days early on the basis that we can set up the automated blogger system to post this on the Friday as normal. First things first: if you read last week’s blog early you will be under the misapprehension that I was subjected to some capricious editing. Not so: the ‘mistake’ friends, was mine. Anyway please note the correction. Word has it that copies of The Infinite Day are now out in the wild at least in the United States and so I am hoping for reviews fairly soon. Can I make a plea here that, if you are thinking of posting a review (and do post favourable ones come the summer) that you avoid spoiling the plot? I went to quite a lot of trouble to put in some twists and turns and a little bit of bluffing in the book, and would appreciate it if that went unexposed. Certainly on this blog site I reserve the right to edit, prune or delete anything that I think may spoil the enjoyment. On the Facebook fansite there is a special discussion section for those that have read the book. Gosh, that all sounds rather miserable doesn’t it? I have been keeping an eye on Amazon.com and have been pleased to see my ratings briefly rise up to 6,000 or so for The Infinite Day. Of course we really need to get them down to the thousand mark but it’s progress. I saw somewhere that they reckon the average book sells 99 copies. So I guess I’m a success. Hmm. Anyway, with it being a wet half term I have been sitting indoors either scribbling frantically or working at the computer putting together ideas for the next book series. Some of you may be fascinated to know that something of a priority has been to get my geology right. So I have been playing around with plate tectonic models to produce convincing lines of volcanoes and the right sort of coastline. Well if Tolkien could spend years tweaking his grammar then I can do the same with geology. Incidentally, if you are at all unfamiliar with plate tectonics it really is astonishingly powerful in its ability to explain landforms and ‘the way the world is’. It is so compelling that although commonly termed the Theory of Plate Tectonics it has the much merited status of fact. I have only ever heard of a single reputable geologist who disagreed with it; and he dissented over one aspect of it. I rarely talk about creationism here; I am already suspect as far as eschatology goes. (If you really insist in pigeonholing me I am an Old Earth or Continuous Creationist.) However I cannot resist mentioning my suspicion here that the shift in focus of creationism from ‘The Flood did it all’ to Intelligent Design reflects the fact that plate tectonics makes an overwhelming case for an ancient Earth. Plates a hundred kilometres thick can hardly race around the surface of the Earth hitting each other, separating and hitting something else over a few months. It must take an awful long time: but given that the Bible talks about a long timescale for the earth (Habakkuk 3, Psalm 90:2-6, Micah 6:2) that isn’t a problem. Dear Reader, if you previously read this blog, read again! This is an updated version. On Monday a package was awaiting me when I got back from College; my own copy of The Infinite Day. Three quarters of a million words finished! I was tempted to mutter ‘Lord, now let thy servant depart in peace…’, but there’s plenty of other things do yet. Anyway it looks very fine and to those who like to see such things, here are all three together in a complete set. Frankly, there have been times when I thought we wouldn’t get this far. And we have! Well God is faithful but I am also grateful to you, my fans who have kept the project alive. I have barely dared open the new book for fear that some horrible spelling error or grammatical infelicity would leap out and assail me. However Alison, my wife, editor and dedicatee, started to read through it again and seems to be enjoying it. However she was extremely irritated about one petty point. On one page Merral and his team are described as playing basketball on the ship. Now if you read the first version of this blog, you will note that we presumed an editor or proof-reader had changed this from the original teamball. But no, after writing the blog I received a very gracious message from my editor. She pointed out, which I had completely forgotten, that the author himself decided to ‘revive basketball’ because there was not enough room for teamball on the ship. I apologise profusely to my very careful editors, another of whom queried what I’d done on the grounds that in the other books the game was always teamball. Teamball or basketball is a minor point. The Infinite Day is a super production and I want to publicly thank Tyndale for all their hard work. 1) We have a publication date for the Infinite Day, 1 June in the States. I suspect the UK release will be about a week later. Please nag your booksellers to get a copy and use all means to promote the book. Above all try to get it removed from the subcategory Futuristic of the subcategory Fiction of the category Religious. 1. He names the Antichrist. 2. Tim Lahaye is going to burn it. 4. It terrified the life out of the kids. 5. Hollywood are looking at the film rights. 6. It’s by this really cool Welsh author that nobody knows anything about. 7. It’s actually translated from Serbo-Croat. 8. The author has been arrested by the Israelis for terrorism. 9. There’s a really good joke about Swansea right at the end. 10. He’s very damning about topology. Almost all the above are false, irrelevant or unlikely to be effective. Eight is more accurately expressed as ‘arrested by the Norwegians (on the orders of the Israelis) on suspicion of terrorism’. And it was a mistake: it was Mount Hermon, they should have marked the border and a geological hammer isn’t a weapon And I still say the helicopter gunships were quite unnecessary. Nine is true but unlikely to sell many copies. 2) I did an article for the very helpful High Calling website on leadership. I was rather astonished to be asked because I feel ‘I don’t do leadership’. Anyway I like the result and hope you do. 3) I am probably going to launch a no-holds barred article on the Speculative Faith website in the next 48 hours on why Christians ought to write about nuclear conflict aka the ‘end of civilisation as we know it’. Anyway have a good week and pencil in some reading time early in June. About a month ago I mentioned that I was involved with a big cleanup project by many of the evangelical churches on the southern edge of Crymlyn Bog, a large wetland that has somehow survived on the edges of Swansea. It is the largest area of lowland fen in Wales and of international significance for its birds, plants and insects. The cleanup was scheduled for last weekend – the Bank holiday – and as one of the organisers I was somewhat nervous. The weather in the days before had been very cold and wet and we had made something of a public promise that 200 people would turn up and clear up the rubbish over two days. In the event it all worked out magnificently. People from churches all over Swansea responded in large numbers: the first teams were sent off at ten but people kept on coming! By half eleven there were already 200 people working on the clean up and all our careful plans were in ruins; teams were already working on areas we had reserved for Sunday. New projects were urgently assigned and people were reallocated. By the end of Saturday, we had done all that we had hoped for. Two skips were full and mounds of plastic bags covered the edge of the cycle path. The end result was the removal of over 80 car tyres, three mattresses, one bath, three shopping trolleys and over 800 bags of rubbish. Over three hundred people had been involved and to those of you who live in the States this is a very large number from a fairly slender church community. (The number of active Christians in Wales is probably now under the hundred thousand mark.) Anyway, if you wanted a single event to show that Christianity is not all talk, this was it. It was a tremendous and very visible witness to the vigour and enthusiasm of Bible-based churches in Swansea. One interesting point is that we didn’t really get the local press properly involved. I think we justified not pestering them to turn up on the Saturday because we were concerned about a poor show. I suspect we rationalised not begging for publicity as protecting the honour of the church. Yet I wonder whether it was really a lack of faith. We prayed for the weather to be good and it was. Perhaps our prayers did not really extend to it being a successful witness. It’s an interesting thought partly because in a month’s time I have a book coming out which I expect will get very little publicity. Is the fact that I am not seeking publicity for it here evidence of my modesty, my spiritual maturity or, more worryingly, a lack of faith? 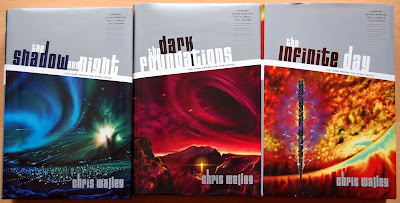 In the nine months since finishing the manuscript of The Infinite Day I have been busy teaching and also involved in an editing project for a friend that, though worthwhile, has been very time-consuming. But that – and the teaching – is shortly coming to an end and I am beginning to think about my next fiction project, which has the working title of the ‘Seventh Ship Series’. I envisage it as another trilogy, though on a slightly more restrained scale than the heavyweight Lamb Among The Stars series. I have already compiled a lot of notes but in some spare moments over the last few days I have been trying to clarify that most important of things: the ending. Yes, that’s right, it’s half a million words away from being written, but I want to know my ending. In fact, I’m not really sure I can properly start writing until I know, at least at a very general level, where I am going. I’m sure many fiction writers feel the same; there needs to be a goal, a fixed point to which we can write. It is however certainly not true of all such writers: I have certainly read many books (and given up quite a few more) where it was evident that the writer really didn’t know where they were going. Rumour has it that Robert Jordan’s enormous and unfinished Wheel of Time series that stretches on for 11 or so books attained its gargantuan length because he didn’t know where it was going. What is so significant about the ending? Three things strike me. The first is that it allows you to distinguish that which is essential and that which is irrelevant. In fantasy, where an infinite number of things are possible, you need that discipline lest you become lost in endless subplots. The second thing is that creating a solid architecture like this allows the build-up of tension and its release at the key moment. I sometimes think of books as being like those situations where you have a thousand dominoes all lined up and then you just tap the end one and they all tumble down in a most satisfying manner. Knowing where you are going helps you set up that situation. Thirdly, the ending confirms, in a deepest sense, what the book is all about. And be assured, my books are about something more than just the tale. Well I’m not sure that I have a proper ending yet. I’m in no hurry: I want it to be good. Popular wisdom says that ‘Coming events cast their shadows before them’. Maybe. Another and truer saying may be this ‘You can’t know where you are until you know where you are going.’ I suspect that may be true of life too.